Spatulable white gelcoat Parafined. Pre accelerated. Gel Coat Kit White Polyester Resin Top Coat and catalyst set. Specially suitable for finishing touches on repairs. Features ORANGEMARINE Cleaning and Care products are developed and produced in France. ORANGEMARINE Product range covers all the uses and provide quality, sustainability and efficiency. Gelcoat is a chemical product composed of resin (polyester, epoxy, vinyl ester) and of a silica or microballoon filler. It is used to create an outer surface for laminates. Applying gelcoat is an important step in the fabrication of a laminated composite hull or deck. It forms the outer coating that will ensure an attractive, watertight finish. It also can be used to line a ship's holds or tanks. Some versions are suitable for contact with food products. All shipyards handling composite materials use gelcoat. 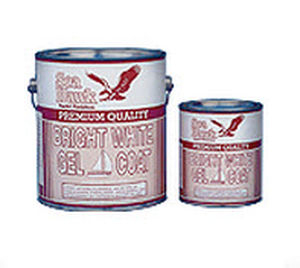 Most recreational sailors keep some aboard for touch-ups. Gelcoat is a mixture of resin and filler, or extender, often silica, sometimes paraffin. It is used to create a waterproof coating and can be impregnated with pigments. Since resins are not always compatible with one another, polyester, vinyl ester or epoxy gelcoat is chosen as a function of the laminate to be coated. The first two dry faster, but are not as waterproof as epoxy. Gelcoat comes in cans as a two-part product, the gelcoat and a hardener or catalyst. Spray-can versions are for touch-up. Choice will depend on the the nature of the laminated material to be coated. Epoxy gelcoat is the most expensive, but also the most waterproof. It is also harder to sand than polyester or vinyl ester.